It take a great deal of staff to meet peak shopping demand for the Christmas Season. Macys starts staff solicitation at the door with this Macys Hiring for Holidays Door Notice. And puts a positive spin on “We’re hiring…” With an eyebrow of “Work. Play. Be Merry!” What’s an “eyebrow.” Well its like a subheading but above the main heading. Just a bit of jargon to help you better communicate with your copywriters and signmakers … Holiday Season or not. 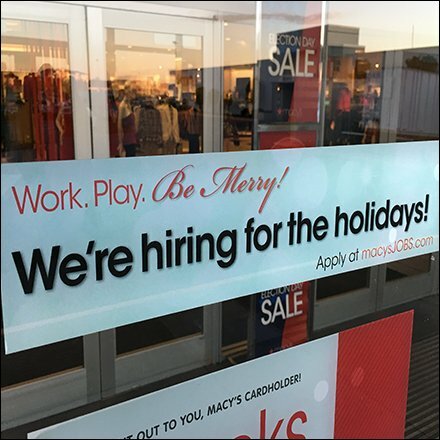 This Macys Hiring for Holidays Door Notice seen in Wilkes-Barre PA.